FAB Facial Radiance Pads contain just the right amount of Lactic and Glycolic Acids to make them safe and effective for daily use. Cucumber and Indian Gooseberry tone the skin, while Lemon Peel and Licorice Root leave the skin bright and glowing. Improves skin tone and clarity. Diminishes the appearance of fine lines. Remove one Facial Radiance Pad from jar and wipe pad across face, neck and decollete. 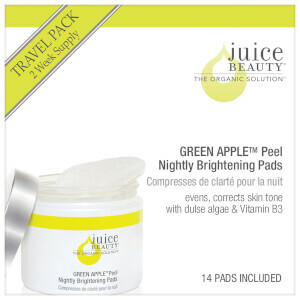 Use in the morning and/or evening, after cleansing and before moisturizing. Water/Eau, Aloe Barbadensis Leaf Juice, Glycerin, Cucumis Sativus (Cucumber) Fruit Water, Lactic Acid, Glycolic Acid, Sodium Hydroxide, Leuconostoc/Radish Root Ferment Filtrate, Camellia Sinensis (White Tea) Leaf Extract, Chrysanthemum Parthenium (Feverfew) Extract, Glycyrrhiza Glabra (Licorice) Root Extract, Citrus Medica Limonum (Lemon) Peel Extract, Citrus Nobilis (Mandarin Orange) Fruit Extract, Hyaluronic Acid, Phyllanthus Emblica (Indian Gooseberry) Fruit Extract, Polysorbate 20. I use these once a day, in the evening. My skin is looking more even; the sun spots have faded slightly. Maybe continued use will make them go completely away. I use these pads with the FAB Repair Cream. My skin has such an even color now and feels oh so soft. Wouldn't be without these. What a bargain all of FAB products. All natural. Why spend a fortune on harsh chemicals?